Taking crania or other skeletal elements, on the one side, we find hollow structures such as the braincase, the frontal and maxillary sinuses, or the inner ear that proved to bear valuable features. On the other side, various anatomical features inaccessible or difficult to measure such as tooth roots, thickness of curved bones or lamina, trabecular architecture, closing patterns of sutures, and others contribute to a better picture of functional morphology as well. These examples are deal only with dried skeletal material, but exposing features of soft tissue in relation to the underlying bones is as well a major concern of anthropological research on non-fossil material. For instance Jeffrey and Spoor worked with high-resolution MR-scans of formalin-preserved human fetuses to explore the development of the cranial base during early ontogeny (which has, of course, implication for the understanding of evolution of modern human skulls). Semendeferi et al. used MR to shed light on the proportions of the frontal lobes in relation to the whole brain in extant hominoids. Their study revealed that human frontal lobes are not that much different in relative size when compared to chimps, gorillas and orangutans. Virtual Anthropology naturally includes the research on living humans, exemplified by a study of Bookstein et al. 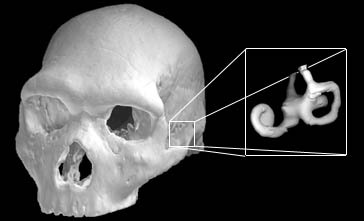 who characterized shape changes of the corpus callosum in fetal alcohol syndrome patients by describing quantitative changes of its mid-sagittal outline from MR-scans. These techniques are good for studies in human evolution as well as to enhance medical diagnosis. That shows again the potential for interdisciplinarity of Virtual Anthropology.